For the past year there has been rumblings in the edtech world about the "Gamification of Education." When I first heard this term I panicked thinking that people wanted to turn my classroom into a video game, I soon found out that this was not the case. Which was a good thing, because I am not a video game player. My research into gamification took me in many different directions, but what really intrigued me was the use of badges to show students competencies. Badges are the reward system used by many video games to show the progress of players to complete certain tasks. As part of my research I even started to play a few video games, the first one I tried was Cut the Rope. I was impressed with how the game taught me as I progressed through the it -- just in time learning. I couldn't help but think back on how we sometimes get this wrong in education; we force Spanish language students to learn years of conjugating verbs and still they still can't speak the language. Music lessons are similar -- we get students bogged down in music theory instead of just teaching them how to "rock!" So many student give up before they get good. If we reverse that and teach them just what they need to know to get to the next level the conjugated verbs will still happen, but later. So I liked the idea of badges, but groups like the Open Badges Project focus on digital badges and here I was teaching young elementary students, they don't even have social media pages, so how were they going to show off their badges? 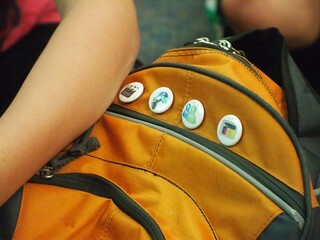 The showing off of your badges is important to the success of gamification. So I started to look for physical, real-world, badges for my students. I looked at lanyards and tokens (like at summer camp) and "Live-Strong" type bracelets. But it wasn't until I stumbled across little one-inch buttons that it hit me. 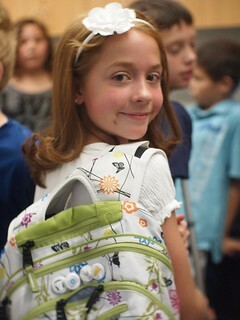 You see, every elementary student has a backpack, the perfect place to put badges, or buttons as I discovered, so that they can show the world that they have earned something for their tech skills. Another unseen bonus that I discovered from the badges going on backpacks was that the student's backpacks hang at the back of the classroom, which now act as a reminder to their teachers that they have tech skills. If a teacher needed a student to take photos during an upcoming field trip to the museum, she just needs to scan the backpacks and find a student who has earned their Digital Photography badge. Here is the button maker I use: http://stores.americanbuttonmachines.com/Detail.bok?no=43 So last year I did a small test with a group of 20 students to see how it would work, next time I will tell you how that worked out.